Life cycle-based adaptations are integral to the ecology of most organisms. For the toxic microalgal species Pyrodinium bahamense, Alexandrium fundyense, Pseudo-nitzschia spp., and Nodularia spumigena, the properties and behaviours of their life cycle stages enable them to thrive in diverse marine environments. Planktonic blooms of these species are associated with a range of negative impacts including fisheries closures and animal die-offs. As a result, their bloom dynamics have been studied extensively, illustrating the ways that each organism’s life cycle is adaptive to recurring biotic and abiotic stressors. Both P. bahamense and A. fundyense form thick-walled resting cysts that play a major role in the dynamics of episodic blooms and can lie dormant for extended intervals in bottom sediments. These cysts function effectively in both tropical and temperate habitats. Nodularia spumigena uses a related but different strategy by producing akinetes that help in its recurrence. Pseudo-nitzschia species do not form resting or benthic stages, but undergo sexuality to counteract the progressive decrease in cell size due to cell division with a rigid siliceous frustule. These life cycles are clearly adaptable to a broad range of environments as shown by their widespread distribution and abundance. 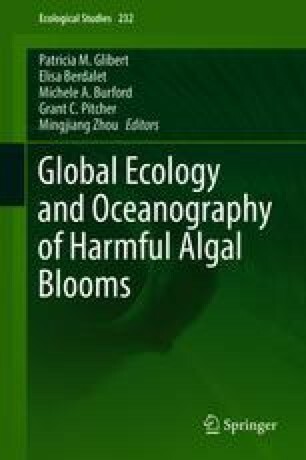 Continued investigation of these life cycles, especially stage-specific interactions with biotic and abiotic conditions, is likely to provide further insights into algal species ecology broadly, including responses to global climate change, ocean acidification, and coastal nutrient enrichment. Rhodora V. Azanza and Michael L. Brosnahan contributed equally to this work. The authors acknowledge the support of (1) the Department of Science and Technology (DOST), Philippines, for R.V. Azanza; (2) the National Science Foundation (OCE-0430724, OCE-0911031, and OCE-1314642) and National Institutes of Health (NIEHS-1P50-ES021923-01) through the Woods Hole Center for Oceans and Human Health, MIT Sea Grant (NA14OAR4170077), and Woods Hole Sea Grant (NA14OAR4170074, R/P-84) for M. Brosnahan and D. Anderson; (3) the national flagship programme RIcerca ITaliana per il MARE (RITMARE) for M. Montresor; and (4) the Cluster of Excellence “CliSAP” (EXC177), University of Hamburg, funded by the German Science Foundation (DFG) for I. Hense. Thanks go to J.C. Dungca-Santos for manuscript typing and Seija Hällfors (Syke) for providing the picture of N. spumigena.